Rev. Billy Isenor is our Priest in Charge and is, essentially, the current spiritual leader of our parish. Rev. Billy attempts to be available in his office at the church from Tuesday through Thursday, 11am to 4pm, and Fridays from noon to 4pm. He is available through his church email. For urgent matters, he can be reached at 780.851.2098.
or, for an emergency, by cellphone at 587.985.8509. We are blessed with two two Honorary Assistants, Rev. John Rushton and Rev. Lesley Hand. John has had a long-term pastoral ministry in the community and Lesley is the Executive Director of On Eagles’ Wings. Our diocesan Bishop is the Right Reverend Dr. Jane Alexander, who can be contacted at the Diocese of Edmonton Synod office 780.439.7344. Tara Munn is our Youth Minister. Wardens occupy particular roles in the parish, as they assist the Rector, and serve the people of the parish in a special capacity. Our current Wardens are: Winnie Kennair (Rector’s Warden) and Reva George (Peoples’ Warden). Ian Bowden is our webmaster. Enquiries regarding Auggie’s Café should be directed to Dianne Brown. For information regarding renting our church building, please contact Winnie Kennair by email or phone at 780.960.1114. If you are seeking to know more about baptism, marriage, anything involving our worship, pastoral ministry, or Christian education, please contact the church office. On November 1, 2017, the Reverend Billy Isenor became our Priest in Charge. He is now our Rector. Rev. Billy was born and raised in the Roman Catholic Church in Penticton, BC. During his time in British Columbia, Rev. Billy traveled and worked at many restaurants in the province, seeking to discover new adventures and please many people’s palates as a chef. Cooking and serving in the hospitality industry helped cultivate Billy’s own relationship with Jesus and understanding of the feast at the Eucharistic celebration. The latter fostered a deep contemplation on how he wanted to serve God by serving others. That discernment process led Billy to move to Edmonton in 2004 and begin his exploration and calling toward ministry. He studied at Newman Theological College and graduated in 2010 with a Master of Theological Studies from Newman Theological College. Life took an unexpected turn for Billy as he felt calls to both ordained ministry and marriage and family life when he met his wonderful and supportive wife, Dana Hunter Isenor. Dana and Billy decided to embrace their faith within the Anglican Church at St. Faith’s, Edmonton in 2012. Together they have two amazing daughters, Alison and Florence. 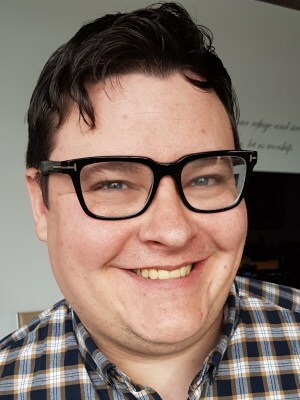 Billy has served in many ministries, such as a chaplain at Alberta Hospital, St. Francis of Assisi hospital in Philadelphia, PA, Edmonton Institute for Women, and the Edmonton Institute (the men’s maximum security prison). He was invited to give parish missions and conferences throughout British Columbia, Alberta, and Saskatchewan on the theology and life of St. Francis of Assisi. Most recently, Billy served at Inner City Pastoral Ministry with Pastor Rick Chapman as pastoral associate, and campus ministry at St. Joseph’s at the University of Alberta. Billy is excited to join St. Augustine’s Parkland and looks forward to serving this vibrant Church and hopes to share his joyful friendship with Christ and the Gospels with everyone he meets. Rev. Aaron was born and raised in London, England. His family were occasional church-goers, only attending baptisms, wedding and funerals. When he was 14, he joined the Emmanuel Anglican Church in Croydon, UK. It was here that Aaron started his Christian journey by becoming a youth leader at 17. When he was 19, Aaron moved to Canada and studied History and English at Cape Breton University in Nova Scotia. After he graduated, Aaron planned to study and become a teacher. However, he felt that was called to something else and, after moving to Edmonton, understood that he was called to the Church in some way. Aaron met his lovely wife, Erika, at the beginning of 2015 and they were married in October of 2017. 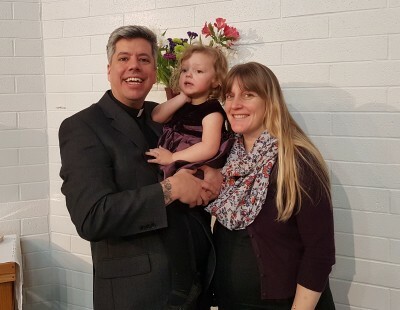 In 2015, Aaron was ordained to the Diaconate and became a Canadian Citizen. On January 25, 2018 he was ordained to the priesthood. Rev. Aaron has many years experience working with youth. From 2014 to 2017 he worked with the Salvation Army in their residential and addiction treatment program. There, he learned in the areas of addiction and mental health. In 2017, Rev. Aaron returned to parish work at St. Matthew’s Anglican Church, St. Albert. 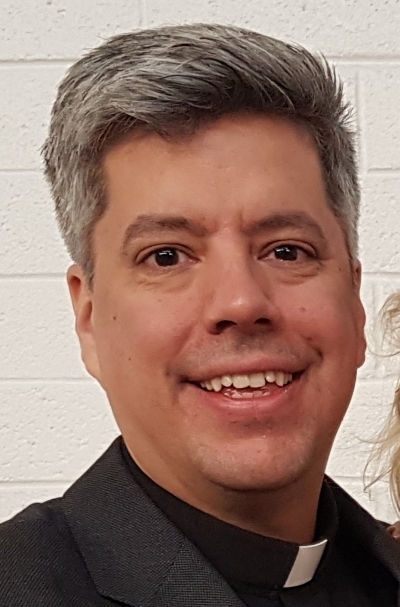 In December 2018, he joined St. Augustine’s – Parkland as the Associate Priest and the Priest-in-Charge for Mission of St. Saviour, Wabamun.